“Spam filtering requires fine-tuning the security mechanism to find the right balance between what to block as spam and what to let pass as a legitimate email. We are happy that our efforts to protect our customers has paid off,” commented Palo Luka, Chief Technology Officer at ESET. Tests used by Virus Bulletin for the VBSpam comparative mimic the end-user’s real experience. It combines two live spam streams representing mailboxes all over the world, as well as a live stream of legitimate international emails. ESET Mail Security for Exchange filtered out all but five of 58,054 spam emails in the test, second only to the specialized product OnlyMyEmail. For comparison, the median value across all of the 21 spam filtering solutions in the test was 126 missed spam emails. 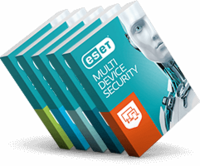 Visit www.eset.com to learn more about ESET's cybersecurity protection portfolio. Comprehensive protection with off-premise cloud sandboxing leveraging machine learning & behaviour-based detection. Why you need to start taking Data Protection seriously, and how ESET can help.